Owned by the girl scouts for 60 years! now being offered for sale! Offered for the first time in 60 years is the historic Flying _G_ Ranch. Since 1945, this ranch has been a Girl Scout camp. It has 360 acres, a lodge, camp facilities and historic a log home and barns. Two year-round creeks meander through the tall trees and picturesque meadows that frame the campgrounds. 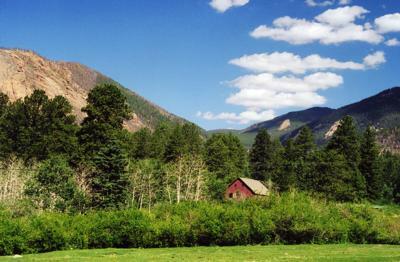 On all four sides it borders Pike National Forest; Lost Creek Wilderness is close by. Now, you or your favorite church/charity have an opportunity to own this prime and scenic property.